Many parents think baby that teeth don’t matter because they eventually fall out. The truth is they are very important to your child’s health and development. Primary, or baby, teeth need to remain healthy to keep children on track emotionally, socially and physically. Here are five reasons baby teeth are important. Enable good nutrition through proper chewing. If teeth are broken, missing, or a source of pain, then the foods your child is able or willing to eat may be limited. Healthy teeth foster healthy eating. Aid in speech development. We rely on our teeth to make many of the sounds used during speech. Without all of the teeth present, children can struggle to properly communicate through speech. The letters s, z, j, and x require tooth-to-tooth contact to make the proper sound. Letter sounds for d, n, l, t, and th are achieved with tongue-to-tooth contact and the sounds for f and v are made with lip-to-tooth contact. Teeth are an important factor in the way we communicate. Help your child do better in school. Children in dental pain have trouble paying attention and learning in school. They are also more likely to miss school due to dental pain and multiple dental appointments. Studies have shown that kids with healthier smiles academically out perform those with cavities and dental pain. Save space that is needed for the proper development and eruption of adult (permanent) teeth. When a baby tooth is lost too soon, the permanent teeth or other baby teeth next to the lost tooth can drift into the empty space. This can block the space needed for the permanent tooth to erupt. The permanent tooth can come in half way, come in crooked or in a different spot, or it may just stay in the bone. When this happens, braces or surgery may be required to help the tooth or teeth that are blocked erupt into place. Build self-esteem with a beautiful smile. Just like adults, kids can feel self conscious about their teeth. They can be bullied if they are missing teeth or show a lot of silver fillings. It is best to keep their smiles healthy and bright. 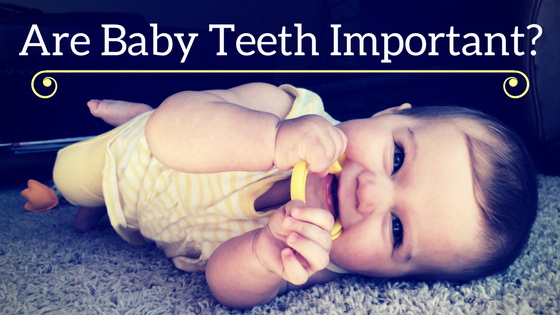 The first baby teeth come in at around 6 months of age. The last baby tooth is lost around age 12, sometimes later. Starting infants off with good oral care can help protect their baby teeth for most of their childhood and their adult teeth for decades to come. At Generations Dental, we recommend seeing a child around 6 months after their first baby tooth erupts or around their first birthday, whatever is sooner. At this visit, we will check your child’s mouth for proper development but also spend a lot of time educating parents on the best way to care for these important teeth.